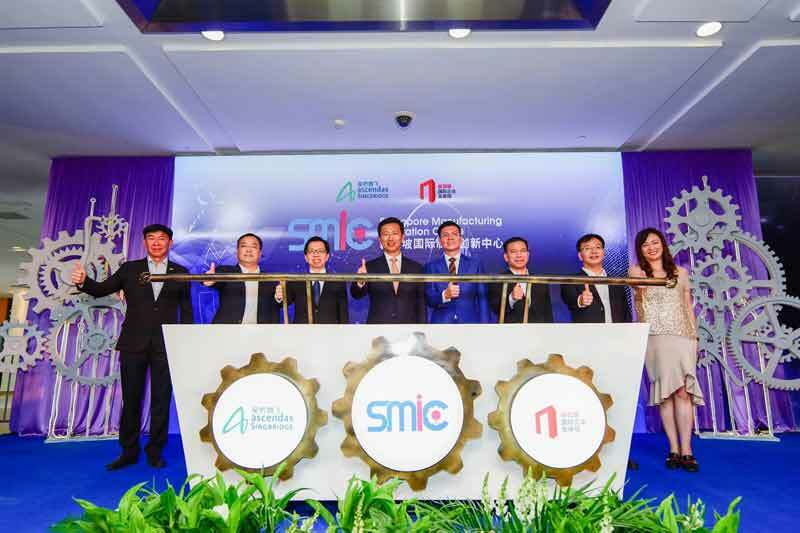 On August 21 2017, International Enterprise (IE) Singapore and Ascendas-Singbridge launched the Singapore Manufacturing Innovation Centre (SMIC) in Guangzhou, a one-stop shop to facilitate partnerships between Singapore Industry 4.0 (I4.0) technology solutions providers and Chinese enterprises looking to adopt such solutions. This will help Singapore companies tap rising demand in China, arising from the “Made in China 2025” initiative (MIC 2025) aimed at leveraging technology to upgrade traditional industries and develop its advanced manufacturing sector. Located in the co-working space within Ascendas OneHub GKC in the Sino-Singapore Guangzhou Knowledge City (GKC), the opening of SMIC was graced by Mr. Ong Ye Kung, Minister for Education (Higher Education and Skills) and Second Minister for Defence and Mr. Chen Xiao Hua, Mayor of Huang Pu District and Executive Vice Director of Guangzhou Development District Administration. Minister Ong is in Guangzhou in his capacity as Co-Chairman of the Singapore-Guangdong Collaboration Council (SGCC). The five Singapore companies, Ascendas-Singbridge and Sino-Singapore Guangzhou Knowledge City Investment and Development Co. Ltd will sign a strategic partnership framework agreement at the eighth SGCC meeting on August 22 2017. With a strong manufacturing foothold, Guangdong is now driving innovation and tech-driven manufacturing for its next phase of growth. In line with MIC 2025, the Guangdong government has pledged approximately SG$190 billion to drive the upgrade of its manufacturing sector and the adoption of robotics to cope with rising labour costs and shortage of skilled labour. The five SMIC member companies aim to partner Chinese manufacturers in this drive, co-creating solutions that contribute to I4.0 readiness and facilitating the Chinese manufacturing sector transition to advanced manufacturing. Areas of collaboration cover robotics and industrial automation, additive manufacturing, augmented reality, Industrial Internet-of-Things (IIoT), as well as big data and analytics. In 2016, Guangdong’s GDP reached SG$1.63 trillion (7.5% increase from 2015). As a key node of the Pearl River Delta (PRD) Economic Zone, the nine Guangdong cities along the PRD account for more than a tenth of China’s GDP. Guangdong is known for producing white goods such as television sets, electrical fans and refrigerators, and other consumer products like garments, toys, shoes and electronics. Exports of most of these products rank the highest in China. Well-known Chinese manufacturers include China Petrochemical Corp., SAIC Motor and Chinese Aviation Industry Corp. MNCs such as Foxconn and Cisco have also looked to Guangzhou to establish smart manufacturing facilities. The SMIC launch in Guangzhou by IE Singapore is an example of the Singapore Government’s continued efforts to help Singapore companies to innovate beyond national borders. In July, IE Singapore IE Singapore announced the launch of its Plug and Play Network to provide support in business advisory services, business matching and market set-up via co-working spaces in over 45 major cities in 6 key markets across India, China and Southeast Asia. This is to ease market entry for SMEs by helping them find suitable business partners and contacts and supporting them in navigating unfamiliar markets. Featured image via Ascendas-Singbridge Facebook Page. Globally, the Fourth Industrial Revolution (or Industry 4.0), characterised by the convergence of new technologies in the physical and digital spheres, is driving significant changes in production and management systems within the manufacturing sector. The integration of advanced technologies into the manufacturing ecosystem will transform factories into smarter, nimbler and responsive operations that drive productivity and economic transformation.